Do I really need to explain why I’m excited? It’s Brandon Sanderson, that’s all you need to know! It’s also the first book of a new series, so I’m curious to find out more. 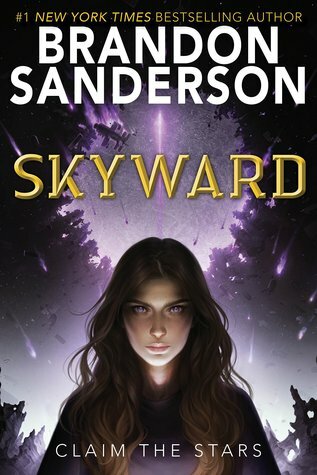 “From Brandon Sanderson, the #1 New York Times bestselling author of the Reckoners series, Words of Radiance, and the internationally bestselling Mistborn series, comes the first book in an epic new series about a girl who dreams of becoming a pilot in a dangerous world at war with aliens. Ooh nice! Have yet to read one of his books! And whoa! That cover reminds me of the fan art from the Books-a-Million ACOWAR! Which I forget what Redbubble or like site artist designed! I’ve been meaning to read something by this author and what better opportunity than with a new series. Great choice! How the hell does he do it? I’m starting to wonder if the man ever sleeps, or if he has a team of ghostwriters publishing under his name. He’s more of a publishing powerhouse than King was at his prime. Love it! Maybe now I’ll finally read my first Sanderson 😉 Plus bonus points for being science fiction! Ooh yes, I’d forgotten this was coming out but I really want it! Oooooo A Sanderson scifi? Intriguing! I shall have to catch up. This book sounds awesome but I can’t start another series or I might just go insane!! Haha whew, Brandon Sanderson…this guy knows how to chug ’em out! 😂 Can’t wait for this one either! Yeah, the man is a machine! Sounds like a book that I would enjoy! Great review. Not heard of this one before but I do like Sanderson and it’s got a pretty neat cover that would definitely draw me in.